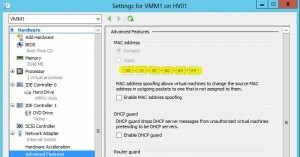 In this post I’m going to talk about the MAC Address Pools in Hyper-V / VMM and the actual way they work. It seems easy to setup and never look at it again but this can cause some serious issues. There are many threads on technet forums about virtual machines changing MAC addresses and especially Linux virtual machines losing network connection. In the Hyper-V Manager you can set a specific range what addresses are allocated to the VM’s. You can see/edit the range under the “Virtual Switch Manager”. So every new VM gets a MAC address in this range specified on the Hyper-V host. As you can see the allocated MAC is within the specified MAC range. You could set your own MAC here, using the static MAC option. But what happens when you have more than 1 host?? Make sure you do not use the same range on different Hyper-V hosts!! Once the MAC address pool is created when the Hyper-V role is installed, imaging the host will cause each Hyper-V server deployed using the image to have the same MAC address pool. Even if you sysprep the host before you image it, the registry values are not reset. When Live Migrating VM’s to a different host there’s no problem and the VM will keep the same MAC. – Antoher VM uses the same MAC. If you’ve set a static MAC, the MAC moves between hosts. Unlike Windows, Linux VM’s (Redhat, Centos, Ubuntu etc.) have the MAC address hardcoded in configuration files. 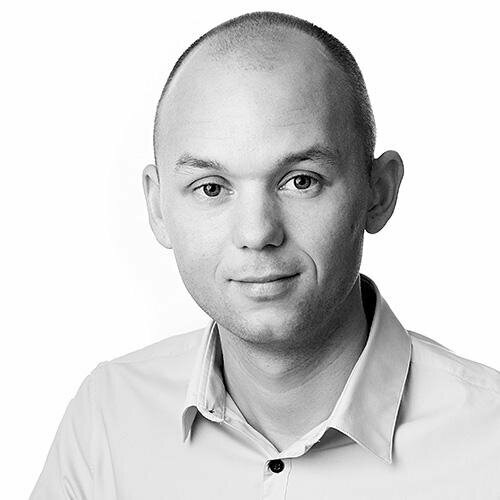 When the above situation occurs the VM will get a new MAC and loses network connectivity. You will need to edit the network cfg’s and enter the new MAC to get the VM online. Make sure you use static MAC addresses in this situation! 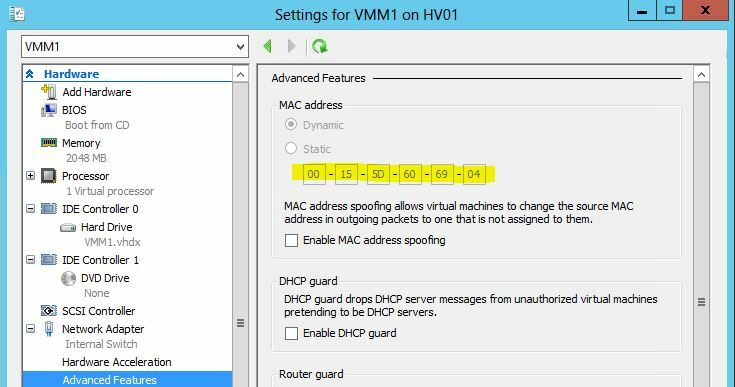 In VMM a default MAC Address Pool is created with range 00-1D-D8-B7-1C-00 to 00-1D-D8-F4-1F-FF (3998720 addresses). 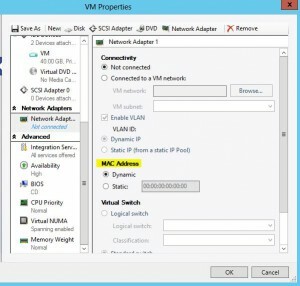 VM’s deployed with VMM can make use of this default pool when the NIC settings are set right. 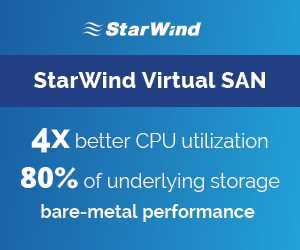 Select static (also in templates and hardware profiles!) to make use of the default MAC Address Pool and overcome any MAC problems. Once you allocated a MAC from the MAC pool the MAC stays static on all your Hyper-V hosts. 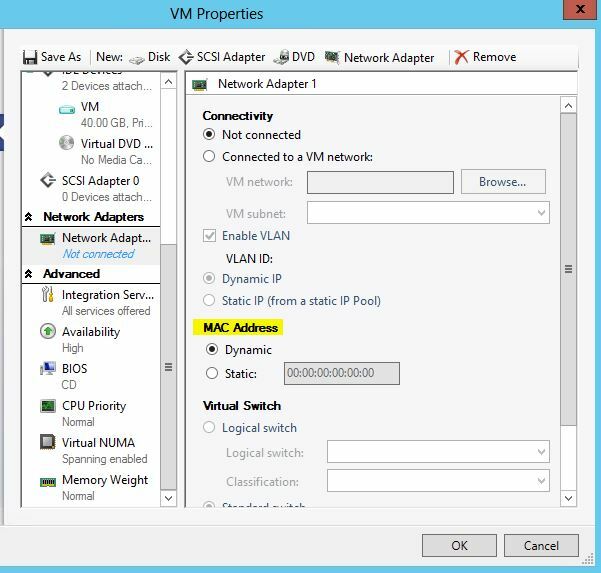 When deploying a virtual machine using the Hyper-V Manager on a host managed by SCVMM, the virtual machine will not use the SCVMM static MAC address pool, but will use the locally defined dynamic MAC address pool on the Hyper-V host when selecting “Dynamic”. When selecting static here, you will need to make up a MAC.